It's that time again: lately I've been feeling antsy with my current blog design, even though it really wasn't that long ago that I was redoing it for the first time. The trigger for this particular blog overhaul actually came from some frustration with my own work. I felt like my current batch of paintings weren't giving off the vibe and look that I wanted, so I decided to create a sort of inspiration board/style guide for them. 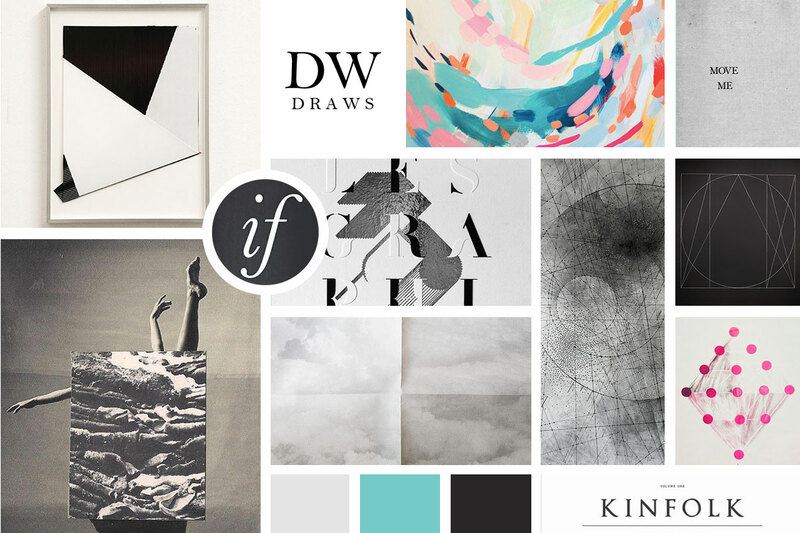 I'd never tried this with any of my work before, but before I knew it, I was obsessively collecting images, whipping them into a mood board (above), taking a Skillshare class for branding advice, and painting up a storm (we'll see if any of the paintings see the light of day, but at least I'm enjoying making them!). This process also inspired me to redo my website and blog design to better align with and highlight my painting aesthetic. I'm still working on that part, which will take a while longer since web design is not something I've ever studied. I'm hoping to also take a Skillshare course on logo design -- any recommendations? And finally, because one of my pet peeves about mood boards is how infrequently they credit their images (I'm guilty of this too! ), the sources from my mood board. If anyone knows where the "move me" image comes from, let me know so I can credit it properly!